Woman in the hotel room - Answer! Why does something that tastes so good have to be so bad for us? Sugar is delicious. Anyone who denies that is lying. But because life is unfair, sugar, especially in copious amounts, is really bad for your health. In fact, once you learn about all the ways sugar impacts your body, it’s difficult to look at it the same way (despite knowing how heavenly it tastes). So how do you know if you’re eating too much? Here are eight red flags your body is sending you that it’s time to cut back on the sweet stuff. 1. You constantly crave sugary things. 2. You feel sluggish throughout the day. What goes up must come down. After sugar causes an initial spike of insulin and that “high” feeling, it causes an inevitable crash. “Energy is most stable when blood sugar is stable, so when you’re consuming too much sugar, the highs and lows of your blood sugar lead to highs and lows of energy,” Alpert says. Eating a lot of sugar also means it’s likely you’re not eating enough protein and fiber, both important nutrients for sustained energy. 3. Your skin won’t stop breaking out. 4. You’re way moodier than usual. The blood sugar crash that happens when you’re coming off a sugar high can cause mood swings and leave you feeling crabby. Not to mention, if your energy is also tanking, that just contributes to a bad attitude. 5. You’ve been putting on some weight. Excess sugar is excess calories, and since it has no protein or fiber, it doesn’t fill you up (so you just keep eating it). It also triggers the release of insulin, a hormone that plays a big role in weight gain and diabetes. When we eat sugar, the pancreas releases insulin, which carries sugar to our organs so it can be used for energy. When you load up on sugar, your body’s told to produce more insulin—over time, that excessive output can lead to insulin resistance. Insulin resistance means our bodies can’t respond to normal amounts of insulin properly and therefore can’t use sugar the right way. The initial weight gain from simply eating too many calories from sugar is being compounded by the disruption to your normal insulin response (there’s a link between insulin resistance and obesity). What’s more, when the pancreas works in overdrive for too long you can develop type 2 diabetes. 6. You’ve been getting more cavities. When bacteria chow down on food particles in between the teeth, acid is produced, which causes tooth decay. Our saliva maintains a healthy balance of bacteria on its own, but eating sugar can impact the pH and throw off the natural ecosystem. This gives the bacteria a chance to thrive and multiply, leading to cavities. 7. Your brain tends to get foggy, especially after a meal. This fog is a common symptom of low blood sugar. When you eat a lot of sugar, your blood sugar levels rapidly rise and fall instead of gradually doing so. “Poor blood sugar control is a major risk for cognitive issues and impairment,” says Alpert. 8. Nothing tastes as sweet as it used to. “Eating too much sugar basically bombards your taste buds,” Alpert says. 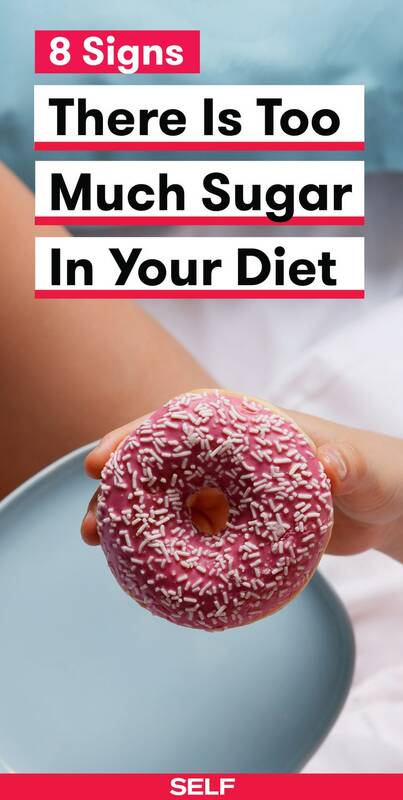 “This sugar overkill causes your taste bud sugar tolerance to go up, so you need more and more sugar to satisfy that sweet craving.” When your taste buds need lots of sugar to feel like something is sweet enough, it can be tough to lower your base level. However, it you cut back and suffer through it in the beginning, you’ll eventually lower your tolerance again and be content with minimal sugar. You might even start to feel like things are too sweet for you and—gasp!—be happier consuming sugar in moderation.